It's been four years since 30 Seconds to Mars put out an album before the December release of 'This Is War,' and frontman Jared Leto knows how long that gap may be to fans. "It's been a long time coming," he told Noisecreep, "and we didn't expect the world to be waiting for us." 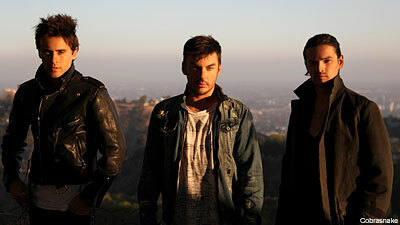 To help refresh memories, the band gave its fans the opportunity to submit photos of themselves for their 'Faces of Mars' campaign. 2,000 different photos from across the globe were chosen to appear on the cover of 'War,' with each physical copy sporting a different fan photo. "We were really just looking for a way to make the physical release of the CD fun and exciting, and a way to say thank-you to people around the world who have supported us," Leto says. While Leto admits that organizing all 2,000 photos wasn't the easiest task, the singer says that the fan reaction has been worth the busywork. Because the location of each individual copy is unknown, fans have been posting different album covers on social networking sites and trading physical copies with fans in different countries. The digital copy of the album, as well as the cover behind each individual photo on the physical copy, features a close-up picture of a tiger that is incorporated into the artwork on the vinyl release. 'Faces of Mars' was an extension of the band's' Summit' campaign for 'This Is War,' in which fans contributed sound effects and vocals to the album during in-person and digital events organized by the band. Although 30 Seconds to Mars have yet to unveil any fan-friendly plans for future release, he says that he would love to keep interaction with fans at a high level with each new album. "We have a lot of ideas, but we couldn't do everything all at once," says Leto. "It's something that we really had a lot of fun doing, and it certainly made a big impact on the music itself."